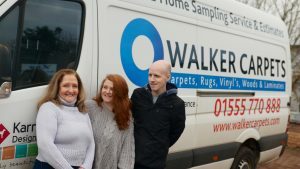 Walker Carpets is a family run business based in Carluke, offering the community quality flooring for over 25 Years across Lanarkshire. We have a large range of Carpets, Rugs, Vinyls, Laminate wood & tiles and specialist flooring such as Camero, Karndean & Amtico. We can arrange a home visit, bringing with us all types of flooring samples to help you choose the ideal floor to best suit your needs. Visit our SHOWROOM & CLEARANCE CENTRE at the Castlehill Industrial Estate Carluke to see your next flooring for your home. Chat to our sales team Ann, Tracy, Roy or Alan about your ideas for your home, business or rental property. We offer Free Home Sampling Service & Estimates.